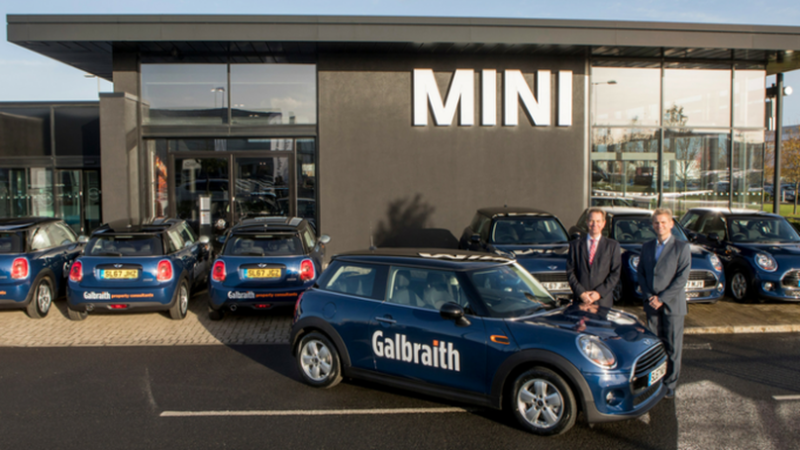 Galbraith has taken delivery of seven sparkling new Mini Coopers to celebrate its new corporate branding. Galbraith has enjoyed continuous growth for many years and this year again we are seeing very strong demand for our wide range of services. The Mini Cooper is an icon in British branding and has been a firm favourite with the British public since 1959. The new BMW Mini Cooper is one of the best-selling cars in Europe and is known for its reliability and premium quality. These are attributes which correspond with Galbraith's long-established reputation for professionalism and as a premium brand. The cars will be delivered to the Galbraith offices in Aberdeen, Ayr, Cupar, Elgin, Galashiels, Perth and Stirling for staff use. The commercial division of the firm manages in excess of 450 million of property across the UK with a 6.5 million rent roll as well as providing asset management, investment, valuation, facilities management, sales, lettings and acquisition services. The residential division of the firm handles sales of 42 million per quarter, and has unrivalled local knowledge and expertise. Galbraith is Scotland's largest and leading rural consultancy managing and providing advice on farm, forestry, land and estate interests on over three million acres. In addition, the firm has specialist divisions providing a full range of services in the fields of energy consultancy and building surveying, with a separate department, Sporting Lets, which arranges field sports and accommodation for guests at Scotland's leading sporting estates.